I’ve been a supporter of Refuge for some time now and you may have seen me post on here, or on my other social channels, about campaigns they’ve been running. Every week two women lose their lives as a result of domestic violence; that’s over 100 lives lost unnecessarily through preventable events. Domestic violence is something that I’ve always been a campaigner against, having had close friends and family be victims of violent partners throughout my life. It destroys families, ruins the lives of women and causes deaths which are simply inexplicable. I’m so pleased that one of my favourite brands are launching a campaign to raise awareness and funds to support women and provide the help they so desperately need. 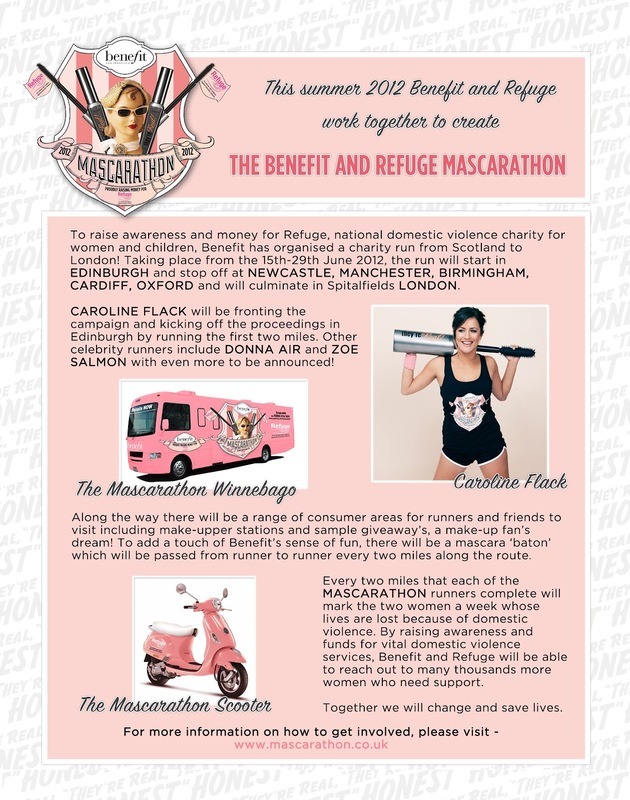 Benefit’s Mascarathon, fronted by Caroline Flack, is a fabulous idea which I’m wholeheartedly supporting – I hope you will too. I can’t explain it any better than the info below, so please take the time to have a read and, if you can, get involved.